Be the first to try out new features on ProtonVPN Android. Join our Android Beta Program! Posted on February 1st, 2018 by Irina M in Articles & News. We have recently released the ProtonVPN Android application, but we plan to add many new features to make the application even better. In order to involve the community in this process, we are starting a new Beta program for Android. 2018 will be a busy year for us as we add more features to ProtonVPN and we are very excited about that. A key part of that is getting feedback directly from the community which we serve. Participants in the program will receive early access to the new versions of the Android ProtonVPN app with new features and bug fixes before they become publicly available, and are invited to give feedback to the team. If you are already an Android Beta user, please uninstall the version of the app that was installed by Crashlytics and install the official version from the Play Store. To register for the new Beta, visit the bottom of the ProtonVPN Play Store page where there is an option to join the Beta program (click where it says “I’m in”). Note: this only works if you first uninstall the Beta from Crashlytics. 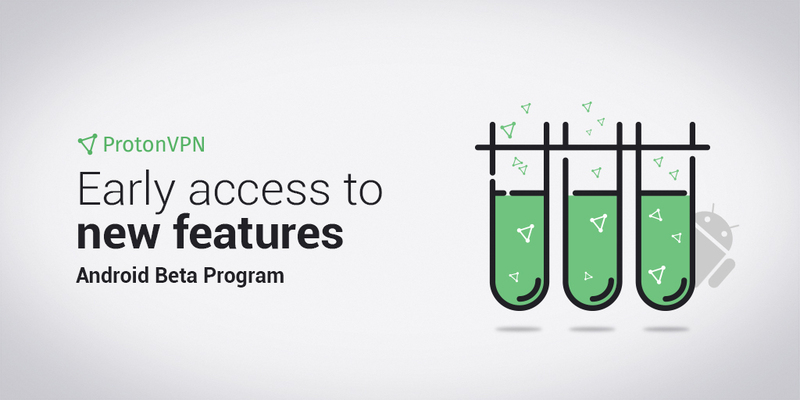 If you are not a participant of the old Crashlytics beta program, you do NOT need to uninstall the ProtonVPN app you got from the Play store, because the Beta version will automatically replace the ProtonVPN app (this happens whenever your Android device updates its apps). If you find bugs or would like to give other feedback, you can reach our dev team by contacting us here. You can also leave the Beta program whenever you want via the ProtonVPN Play Store page. Let’s build the best Android VPN application together! The Android beta app works perfectly fine for me. The only disadvantage is it lacks an option to connect through the network of the organisation I work for. I presume they use a LAN, as I read in the support section of your homepage that IKEv2 doesn’t support LAN. Thus I have to use the OpenVPN app to connect through TCP. This Vpn has some good features and its free of cost so you can connect to any server that is available in it.
. It is a brand new technology, but Microsoft will be betting heavily on it over the next few years as headset hardware gets even better and software developers catch up. Thanks for sharing the great article with us. Signed up for beta today- will one of the beta features eventually include an improved killswitch for IKEv2? Just thought I’d throw my two cents in here. I really like the Android App. It only has one flaw from my perspective. That is that I get two notifications saying it’s connected. I hardly ever open my Android and rely heavily on the notifications, so this clutters things up a bit. Other than that, I’m not sure how you’re going to improve it. Of course, I’m really waiting for the Mac and IOS versions to become available 🙂 I’ll be using those a lot more frequently, so may have more detailed feedback.